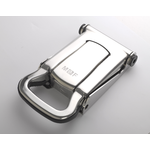 MRF designs, manufactures and assembles stainless steel & zinc plated components and systems for the commercial vehicle industry since 1966, mainly locks, hinges and accessories for truck bodies. MRF is a family owned SME located in Galicia, the North-Western part of Spain. MRF offers body fittings in stainless steel and zinc plated carbon steel. All our articles are designed in our in-house engineering dpt. and manufactured on site in Galicia. We manufacture locks, hinges and accessories for truck bodies. Our quality control goes from the incoming raw material over production processes, administration and final products. We export our products to more than 30 countries. We are looking for customers, body builders and/or distributors interested in our products in all main markets.